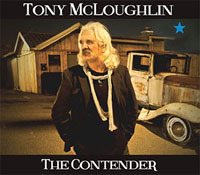 Share the post "Album review: TONY McLOUGHLIN – The Contender"
He may look uncannily like Billy Connolly’s long lost brother, but opening with strains of Muhammad Ali getting ready to ‘rumble in the jungle’, Tony Mcloughlin’s fifth album The Contender is a glorious Telecaster-infused slab of Tom Petty/Springsteen inspired Americana. Working once again with fellow Northern Ireland countryman Ben Reel, this time with McLoughlin co-producing, and with the same rhythm section of Ronnie O’Flynn (bass) and Michael Black (drums), The Contender features the six string virtuosity of long term collaborator German born, Nashville based German Thomm Jutz, German bluesman Timo Gross, and respected Monaghan musician Mick McCarney. Pete Feenstra pronounced McLoughlin’s last outing as encapsulating ‘all that is good in the contemporary roots rock genre’. And on the strength of The Contender, I’d have to concur – the songs while borrowing heavily on the likes of Petty, stand tall in their own right, and while McLoughlin’s Petty / Springsteen / Knopfler imbued vocals are equally derivative, there’s a shimmering vibrancy that’s reflective of much of Reel’s own recent work. This entry was posted in ALBUM REVIEWS, ALBUM REVIEWS (Mobile), All Posts and tagged album, Americana, review, rock, roots, singer, songwriter, The Contender, Tony McLoughlin. Bookmark the permalink.